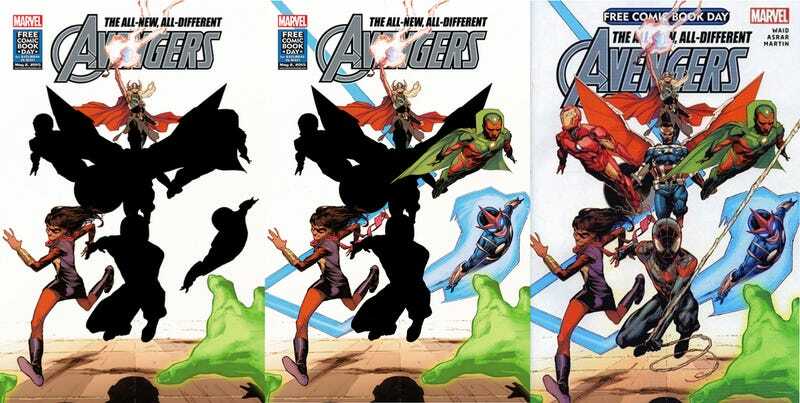 The silhouettes from the teaser image released earlier this week have been fully revealed, showing off the line-up of the All-New, All-Different Avengers. The biggest surprise? The Ultimate Universe's Spider-Man—meaning Miles Morales, not Peter Parker—is front and center. The new roster of Earth's Mightiest Heroes came to light from an apparent leak that made it to 4Chan, which was picked up by nerd culture site Bleeding Cool. As many guessed, the figures on the right were Nova and the Vision, with Iron Man on the left. The visual confirmation of Miles Morales seems to support speculation that this character will be surviving the Ultimate Universe and becoming part of the mainline Marvel Universe. For those who don't know, Black and Latino teenager Miles Morales is the native of an alternate reality who takes up the mantle of Spider-Man, after Peter Parker dies. And, based on the credits, it looks like Daredevil writer Mark Waid will be writing with one-time Supergirl artist Mahmud Asrar and colorist Laura Martin rounding out the creative team. the latest Captain America (Sam Wilson, formerly known as the Falcon when he was the partner of original shield-wielder Steve Rogers).